Pousada Casa Zaza was our next destination. A simple but comfortable guesthouse in the Concha district of Itacare, the town at the mouth of the river Contas. An internationally renowned surfer’s paradise with many bounty like Atlantic beaches. Casa Zaza is run by Eddy, a friendly and amiable Dutchman who always guarantees a warm welcome in his guesthouse. One event I want to mention, because of its unusual nature. It is an accident that eventually turned out to be quite funny. Among the guests at Casa Zaza was a French family, father, mother and daughter with her ​​boyfriend. Nice people. Early one evening we heard a thud and a cry of the daughter afterwards. Joyce, my wife went to look and saw her friend lying on the floor, lots of blood and unconscious. He was transported by ambulance to the hospital. Day and a half tension among the guests was the result, especially since the young man had long remained unconscious. The second morning he was present at the breakfast. It became apparent that this young man was in shock for sometime. After his girlfriend dropped her camera from the window of their upstairs room, he didn’t hesitate, climbed out the window and immediately fell through the corrugated plastic roof covering below the room. The valiant knight, isn’t it? 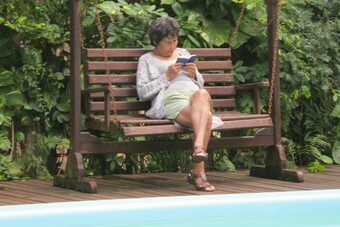 Otherwise everything was calm and quiet in Itacare in preparation for one of the many Bahian festival weekends there. Usually we use bus services in Brazil. A comfortable and relaxing way to travel, ideal for retirees like we are. Plenty of time to watch the scenery and occasionally take a nap. Stop was again Pousada Villa Verde in the Barra, Salvador. A little catch up with Wolfgang is just cozy. 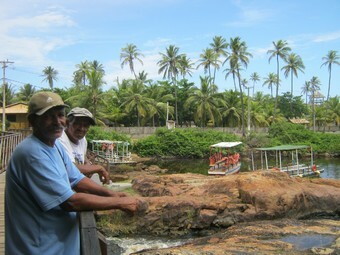 Chatting on the bridge of Imbassai, Bahia. Imbassaí was our final destination this winter in Bahia. This is because for a while we are aware of the existence of Guesthouse Sitio Imbassai, owned and managed by a Dutchman, who in the whole area is known as Jan (John). More Dutch than ‘Jan’ isn’t possible. There is much to tell about him, but that will follow later in this post. After a few days of relaxation in guesthouse Villa Verde we took a taxi to the central bus station in Salvador and searched for the bus company with the inspiring name ‘Espresso Linha Verde’ (Green Line). This bus service we took for the trip to Imbassai, a village which attracts a growing interest from beach tourists. Imbassai is located about 10 km above nowadays internationally famous Praia do Forte. From the Terminal Rodoviaria in Salvador city the bus squeezes itself to the edge of Salvador, through the town of Lauro de Freitas and onwards to the Linha Verde, officially registered as BA 099. This very decent coastal road runs all the way up to the district Conde, at the upper limit of the state of Bahia. Praia do Forte church under heavy rain clouds. 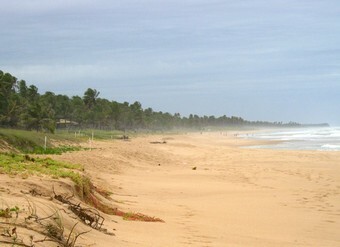 Praia do Forte – Imbassaí. 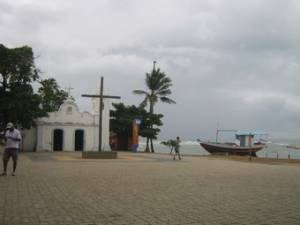 Praia do Forte is a small seaside town which stands model for the further development of the tourist industry in Bahia. This isn’t our exclusive opinion. The town is very touristy. Quite a few people paraded daily through the shopping area which on one side connects to the square at the main beach of Praia do Forte and the busstops on the other side as connection point to the Linha Verde main road. Resorts and new commercial buildings in a nice modern architecture are mingled with authentic Bahian style houses. The town is crowded with restaurants. We visited this little town a few times, mainly because the nearest ATM machines were solely available in Praia do Forte. While the Espresso Linha Verde bus line does stop in the town of Praia do Forte is this not the case in respect of the seaside resort Imbassaí. Dutch Jan awaited us. We maintained cell-phone contact with each other because on the day that we would arrive had Jan to fulfill an obligation in Salvador. We got off the bus on the main road at the entrance to Imbassai village. There always is a number of motorcycle taxis at the bus stop waiting for customers. It is an economical method of transport and frequently used by the village residents. However, with our two sizable suitcases we chose a taxi. No problem for the guys to arrange this for an additional fee. We were brought to Restaurant É Massa, where we ate a snack while waiting for Jan to pick us up. This pick up arrangement was necessary because his guest house is situated at a distance of approximately 3 km’s from the village center, you know. So, Jan and his daughter showed up, had a beer, a chat with the Argentine owners of ‘Restaurante É Massa’ (one of our favourite places to dine after visiting Imbassai beach during that week) and some locals. Eventually we went, in his very old Volkswagen Van, to Pousada Sitio Imbassai, a property of approximately 5 hectare surrounded with tropical lush nature and well kept terrain around the Pousada buildings. A review of this tranquil place and its relaxing atmosphere to which the guests indulge, is given in the Guesthouse Experiences category on this website. I prefer to write some more about Jan, the exceptional Dutchman. Jan, as former South America correspondent for various Dutch TV stations and other media channels, discovered about 12 years ago that Sitio imbassai was for sale. A large piece of land with a small chalet ready for use and two overgrown foundations, layed by earlier good intentions. He bought the property and went to work with it. Renting out the chalet was his first step. He found people who were looking for peace and quiet. With a modest bit of private money and rental income has Jan been building. Slowly but surely a nice and cozy holiday park was growing on Sitio Imbassai. First the main building was constructed, more chalets added, a swimming pool and a second social meeting point, kitted out with barbecues, stone oven, media system and seating. The last extension is a spacy chalet after his own design, constructed and finished under his project management. Add to this the complete and modern (for this area) distribution system for the supply of water and electricity in all buildings. Not bad for a former South America correspondent, isn’t it? 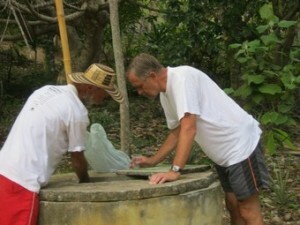 Jan is explaining the water distribution system for his pousada terrain. Bare in mind that his profession was that of a journalist. This didn’t keep him from creating all kinds of technical solutions as well as his own website. We think that Jan is slightly odd, certainly different than average, which we consider to be a positive qualification for him. He is a social skilled person and service minded to a high degree. We had nice and sometimes deep conversations and learned that he once lived realy close to us in Amersfoort, Holland, for a couple of years, on the Bleekerseiland (bleaching island), at that time nominated for new city development. So, it doesn’t exist anymore and I therefore traced down an old photograph from the city archive for him. 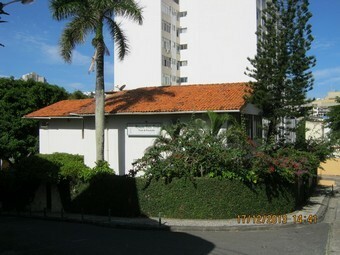 A pictute of the house where he ones lived. Anyway, Jan has build up a valuable property through the years. Prices steadily went up. Is he visionary? I believe so. Visit the Sitio Imbassai website for extensive information. Our daily breakfast we used at Jan’s pousada. 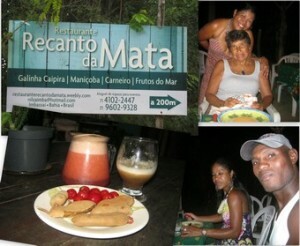 Lunch and dinner either in the village, when visiting the beach, or at Restaurante Recanto da Mata / Corner of the Forest. A tip of Jan. We discovered good food, splendid freshly made Suco de Frutas / Fruit Juice and… Nilza. Farewell dinner on a summer evening. A thank you gift from Nilza and Julio. Nilza owns the place and did build it up from nothing, together with her, literally, great husband Julio. We discovered that Nilza is an enthousiastic follower of Christ, like us. We straight away agreed a food and beverage arrangement for our week in Pousada Sitio Imbassai. The distance between the pousada and Nilza’s restaurant was just 700 meters. We skipped only one day in visiting Nilzas restaurant in the forest. For the rest it was either lunch, after a lazy morning in the pousada garden, or dinner after our return from the beach or visit to Praia do Forte. Nilza is an outstanding and joyful hostess. Her Suco de Frutas is the best we ever had of all the good sucos in Bahia. We therefore chose a nickname for her. She was our ‘Rainha de Suco / Juice Queen. All fruits were freshly picked from their own garden. Especially the Tamarind juice was shocking delicious, my favourite juice. We were treated so well by this exceptional friendly couple. They even gave us a farewell dinner on our last day in Imbassai. We love them. We like more of Bela Bahia.